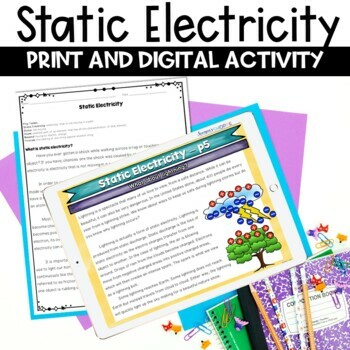 Teach your students all about static electricity, friction, and their charges with this four-page nonfiction reading packet. 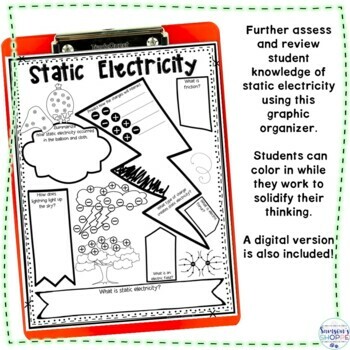 Students will study both static electricity and lightning. 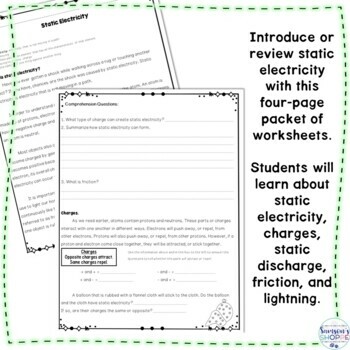 Students will understand what it is, how it is formed, the charges involved, friction, static discharge, and how lightning is formed through static electricity. → Very well done! Love the reading/science tie and that you included answer keys! → Great activity! Students always enjoy something that they can relate and see in their lives. → Thanks so much for this high-quality Science resource! I used this at my Science station! The students loved it! → Perfect addition to my fourth grade class. There are comprehension questions along the way and at the end to assess student knowledge. These worksheets can be used in a whole class lesson, in small groups or is great as a homework assignment. This product was designed and used with my grade 7 small group and inclusion physical science students. It comes in color, blackline master and with an answer key.